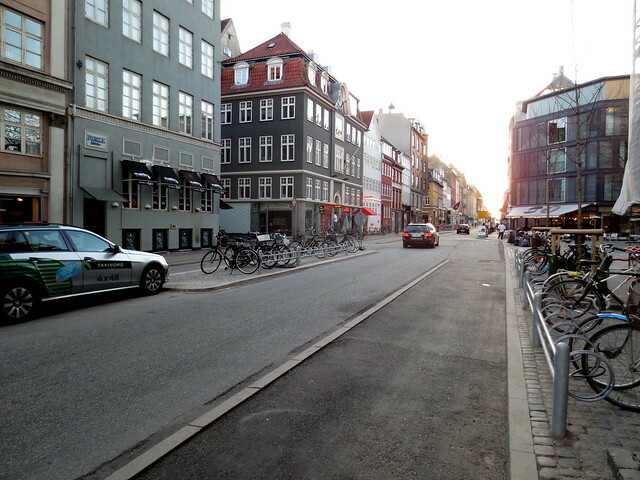 I ventured into the city centre of Copenhagen for a night out yesterday and was thrilled to behold the new cycle track down Gothersgade. 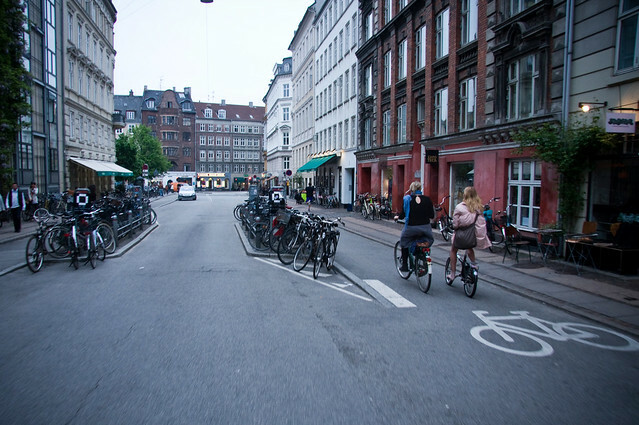 It's a one-way street for cars and bikes - until now. This stretch was a missing link for bicycle traffic. Bicycle users had to do a rather irritating detour to get to key destinations. Now a cycle track runs straight down the street towards the harbour while the street is still a one-way street for cars. Mary blogged about it a short while back - you can see what the street looked like before - and now the construction is almost complete. On some stretches The Arrogance of Space has been addressed by adding cycle tracks in both directions, like above. Narrowing the space for cars to create safer conditions. But what started as an article about bicycle infrastructure on a one-way street is now going to morph into an article about the deconstruction of The Arrogance of Space by using bicycle parking. 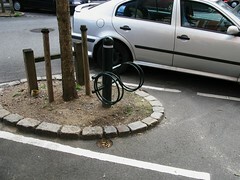 Along stretches of the street, bike racks have been placed on built-up medians between the street and the cycle track. I suppose it creates a buffer between the bicycle users on the cycle track and the roadway, sure, but it really is nothing more than using existing urban space for more rational and practical purposes. Good old fashioned space management. 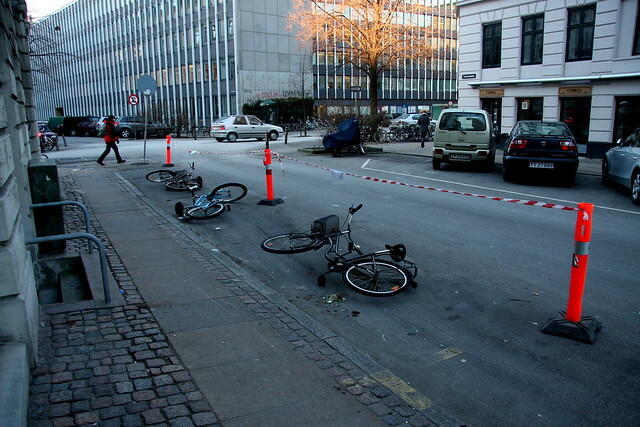 Here's an earlier example of placing bike racks on traffic calming infrastructure. 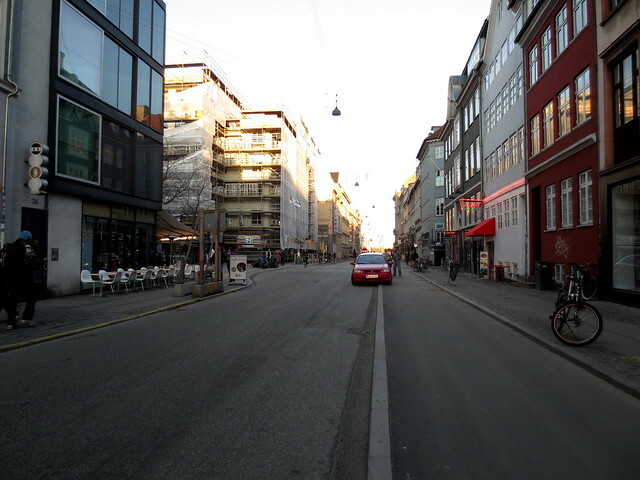 This is in Guldbergsgade in Nørrebro. 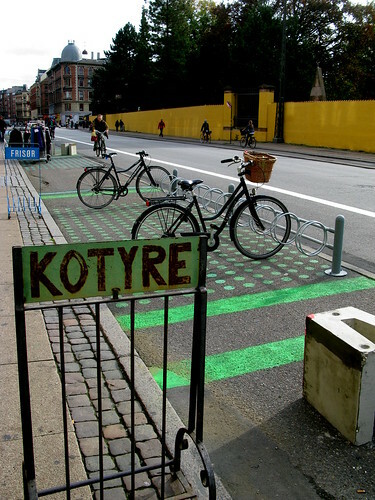 I went exploring through our archives looking for other examples of reclaiming street space for bicycle parking. This is near my flat. A photo I took in 2008. 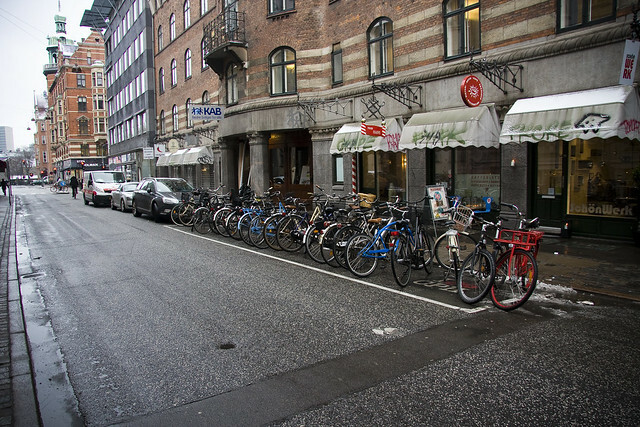 Roughly two car parking spots reclaimed for bicycle parking on Nordre Fasanvej. Notice also the built out half-circle with a newly-planted tree. More space taken back for creating a more pleasant urban environment. Who can hate trees? 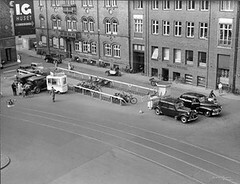 Overflow parking at Central Station back in 2009 used street space while the space outside the station was being renovated. 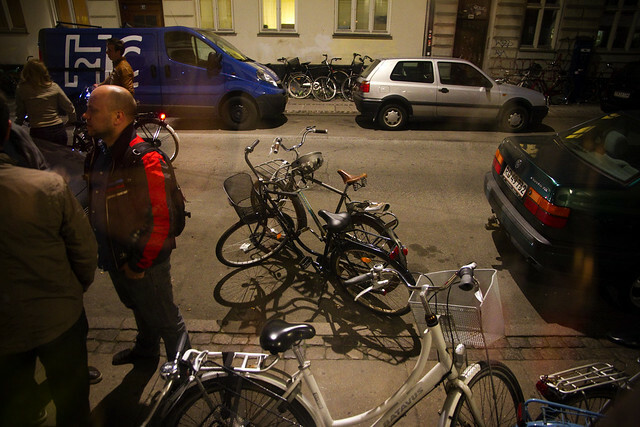 Back in 2009, the City of Copenhagen's Bicycle Office experimented with Parking Zones at four spots in the city. 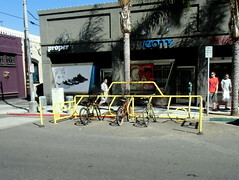 Reclaiming street space for rackless bike parking. Here's an article about these parking zones. 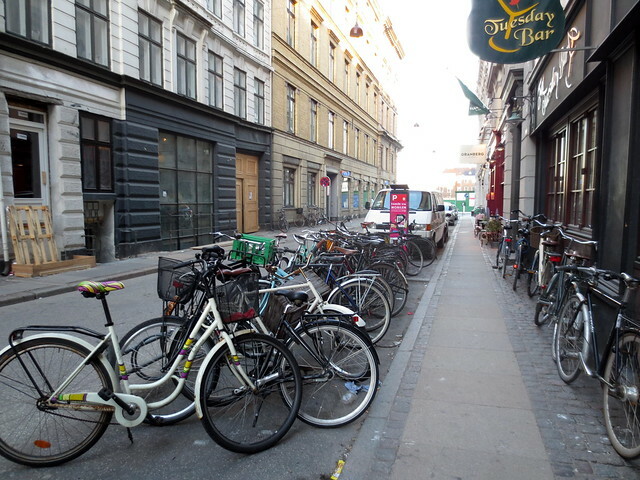 On this narrow street in the heart of the city - Adelgade - bike racks take up the space of two car parking spots. In my neighbourhood, the City of Frederiksberg, there are some good examples of reclaiming street space for use by bicycle users. Top left: another example of taking back a bit of space from car parking and planting a tree. In addition, these little islands feature a couple of bike racks. Top right: it's an older tree, but the municipality slapped in a bike rack and took back a bit more space. Bottom left: This isn't bike parking, it's just a passageway for bicycles crossing the street, providing them with space to get to the cycle track. Bottom right: Car parking spot removed to create six bike parking spots in a shopping district. Here is Your Bicycle. 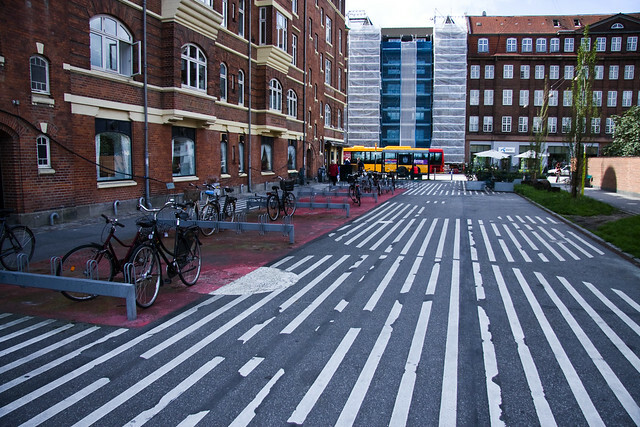 The City of Copenhagen used street space for temporary parking near Nørreport Station. 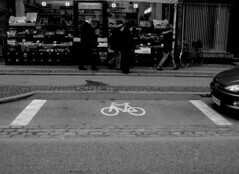 You can read about this Hi, Cyclist! Here is your bicycle! campaign here. 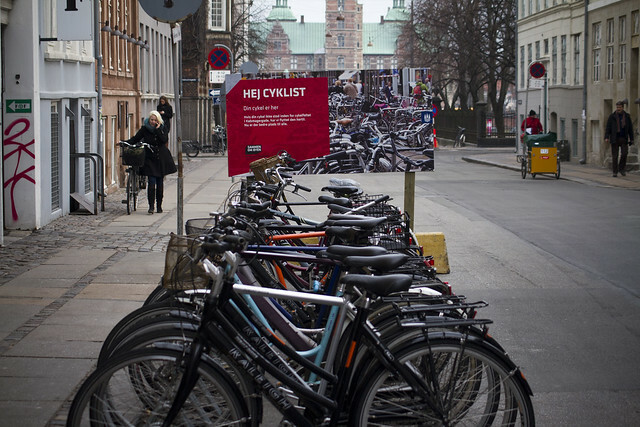 Urban Graphics on a closed off street - for cars - in the Amager neighbourhood with many bike racks for the residents. This street, Elmegade, has been completely traffic calmed and is a slow, cosy street with loads of cafés and shops. 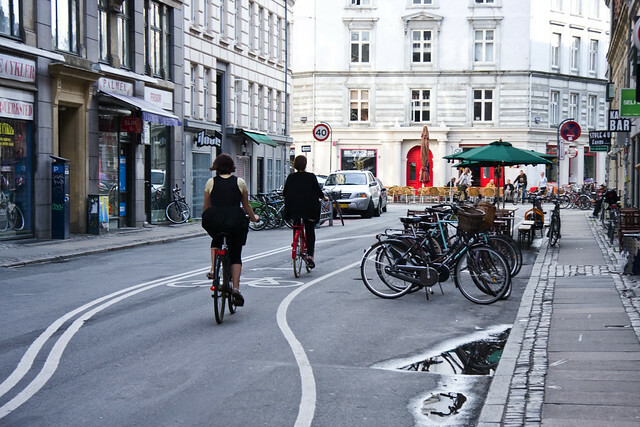 It's a one-way street for cars and the city placed bike lanes in the opposite direction, creatively curving them around reclaimed street space used for bike parking and tables outside cafés. It's a lovely street to ride down. 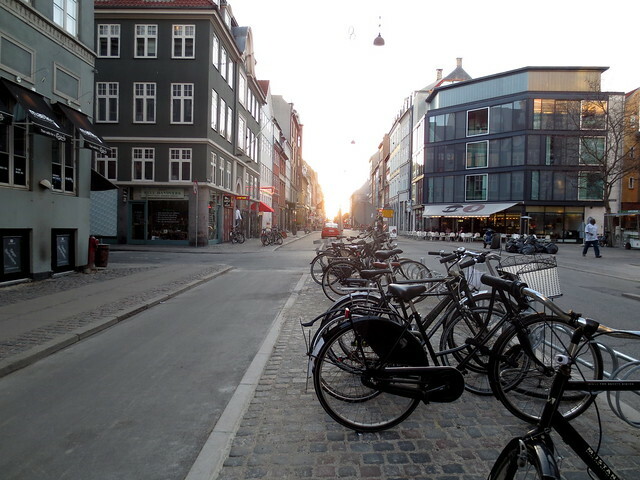 Along Nørrebrogade, when the huge retrofitting project started, the cycle track was reclaimed for bike parking, as well as space for shops to display their goods. Not to worry... a car lane was reclaimed to create space for the cycle track. This was a temporary solution until the permanent infrastructure was built. What started as a fun experiment for me and my friends is now our standard way of parking when we're out on the town. If there is a car parking spot available outside the bar or café we take it back. I did this little experiment called the Bike Magnet a while back and I can assure you that it continues to work every single time. Technically, according to the City's bylaws you're not permitted to do this, but people power is a lovely thing. 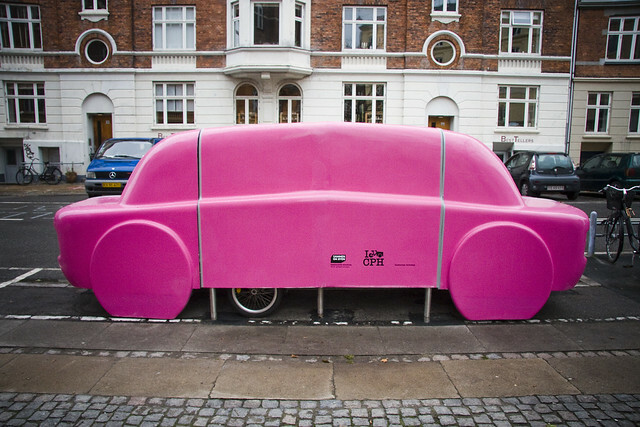 Another innovative project from the City of Copenhagen was this pink car that conquering one and a half parking spots and provided four secure parking spots for cargo bikes. Here's the article about this project. Here's an unorthodox use of bicycles to block curb space. It looks like someone is reserving the space for use by a moving truck or the temporary placement of a container. The orange posts and plastic ribbons are often insufficient in keeping motorists at bay in their search for parking. 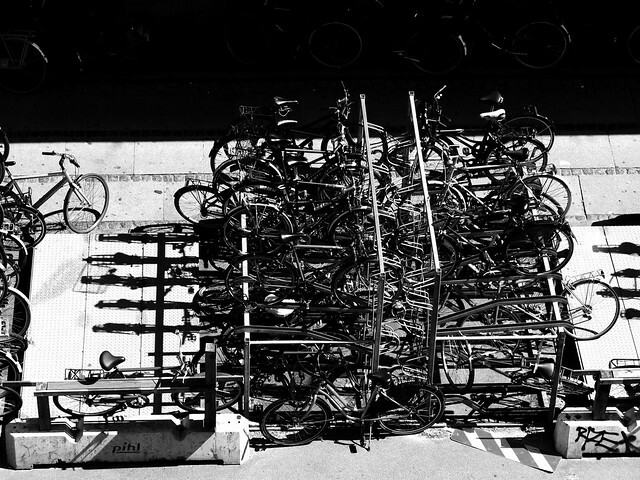 So why not take some bikes and lay them down as a deterrent.. There are, of course, examples in other cities. 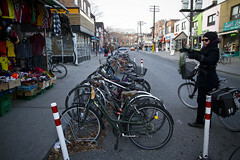 At left is Kensington Market, in Toronto. At right is shopping district in Long Beach, California. All of this is nothing new. 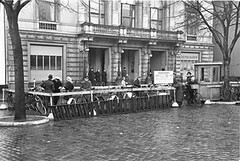 Here are examples of reserving urban space for bicycle parking "corrals" from the 1940s. Now, however, the battle to reclaim space from cars is more necessary than ever before. 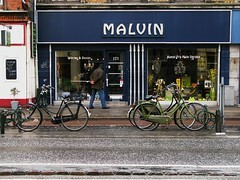 Perhaps these Copenhagen examples can serve as inspiration.